The adventures of a girl and all her personalities. Well, the Pig Roast is over. I am so glad. It is sooo much work and it takes me a few days to recover. I'm achy and tired still. I had a few beers and a glass of punch, nothing to make me hung over for two days, but that is a little bit what this exhaustion feels like. We took the pig out around 5:00. They had to shovel the dirt from the top of the mound. After that, the tarp came off. Then the wet newspaper was peeled back. The last thing to come off was the wet burlap. The wire cage holding the pig was then lifted out of the still hot pit and moved to the cutting table. It only took about five minutes to get the pig out of the ground and to the table. Those coals and hot rocks in the fire pit were still smoking this morning, two days after the pig came out of the ground. We even drenched the pit with water on Saturday night. Amazing. The smell of the cooked pork filled the air once the pig was out. It really smelled good. The marinade gave it a nice gingery aroma. Even though the pig was slightly bigger this year and we had less people, there was more pork eaten. We only had around fifteen pounds of cooked meat left. We did bag it up and put it in a cooler and welcomed people to grab a bag and take it home if they wanted. It's hard to use up that much cooked pork. I'm going to make taquitos and burritos with the left overs I have. I also promised some to a few of my co-workers who were unable to make it. We ended the night with conversation around the fire. We had this pit and the two table pits going. Nobody got too drunk and out of control. Everybody was just having fun. We had a few friends who brought their motor home and popup camping trailers and they just went to bed when the night was over for them. No drunk drivers on the road that way. The only think that happened that was a little uncool was our ornery neighbors complaining about the cars parked along the road. Oh, well. There is a fifteen foot easement on each side of the road and people can park there. Period. They called the police and a sherrif did a drive-by, but didn't even stop. Everything was fine. We were all just having a good time. I was also really glad to have the portapotties this year as that really cut the traffic in the house waaay down. All in all the day was a success. I'm not sure we'll have another one where we open the invitation up to everybody like we did, but we'll probably have another something. We have talked about doing a baron of beef or a smaller pig above the ground, Cuban style. We'll see. Plenty of time to figure all of that out, but for now, I'm going to bed so I can catch up on my missed sleep! Our fire started at 10:00 pm and it was ready for us by a little after 2: 00 am. In the picture they don't look as hot as they were, but those rocks were glowing red underneath. The top of the rocks that were exposed to air looked like normal temperature rocks. Once all the wood was coals, we took shovels and pushed the rocks towards the center of the pit. We wanted a concentrated heat source in the middle of the pit. Then the pig went on. This was a looooong pig. It barely fit in the pit. To me, it looks almost skinny. Without lifting it, I wouldn't have guessed it weighed in at 245 lbs. We laid it down the center of the hot rocks and with a sturdy, steel shovel we scooped as many of the outlying hot rocks as we could around the pig. The goal is to get the pig nestled in a really nice bed of hot rocks, tucking them up tight. We tried something different this year and used burlap as the first layer around the pig after going into the pit. We soaked the burlap all day, then spread them over the pig once it was in the pit. The goal is to surround the pig with a moist seal. That burlap steamed! Whew! In the past we have only used wet newspaper. This year, we put the wet newspaper over the burlap. We had three large garbage cans full. We just slapped the sheets over the mound until all steam leaks stopped. We used every bit of that newspaper and could have used more. We were short this year. Then comes the real work. We covered the entire pit with a tarp and then started shoveling sandy dirt onto the top of the tarp. This really helps seal up any remaining steamy spots and seals in the heat nicely. Shoveling a yard and a half of dirt at 3:00 in the morning seems a bit more strenuous than most of us have the energy for. It got done with some backbreaking heavy shoveling. Once the entire thing was covered with dirt, we then covered it with two more tops, anchored the edges and called it a night. Start to finish...the fire was started at 10:00, the pig was covered and done by 3:15. It's 4:30 am and I just finished making a breakfast casserole with hashbrowns, eggs, sausage and cheese. It's time for me to get some snooze time, as tomorrow is going to be crazy busy and there is still tons of stuff to do. I'm exhausted. It's midnight, or close to it on Friday night and there are 5 hours to go until I sleep. I took a very short cat nap, but now I'm up and I really need to stay up as somebody needs to keep the firetenders company. They have a really nice fire going and all the rocks are in. It is almost at the point where no more wood needs to be added. The logs will burn to coals, heating the rocks until they are super hot and then it will be ready to lay the pig in. Time to put a pot of coffee on. It's still going to be a long night. I spent the day cooking and cleaning and picking up and watching people do the same. We have been slamming the yard and have everything outside is just about done. We got the food tent up late, so we still need to get the tables, wipe them down and get them in the tent and set up. Then we can set up in there. I usually reserve half of one table for plates, flatware, napkins, etc. The rest of that table, and the other two tables on that side get the things like chips, hot dishes, desserts, etc that people bring. The tables across from them get the cold stuff. We built big rectangles from 2x4's that we set on the tables, line with plastic and finally fill with ice. Into this, anything that has mayo or needs to stay cold goes. The table at the head end holds the pork after it's cut from the pig. The pig we got ended up being 245 lbs. Marinating the pig went really well. It wasn't as disgusting as I thought it might be. We stuck it with a knife, and then inserted the needle of the meat injector into the hole and pumped away. That meat injector is awesome and really did a GREAT job of getting the marinate well into the meat. Very little actually ran out. It's been wrapped in foil, chicken wire and metal fencing and has been marinating for about 6 hours. I used soy sauce, pineapple juice, brown sugar, ginger, garlic, and red pepper for the marinade. Sort of a teriyaki sauce, I suppose. Our first party of the year went well. It seemed more laid back than they usually are, but that is probably a good thing. We had lots of good food, lots of good conversation. 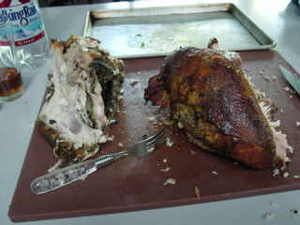 I grabbed a picture of the second half of the second turkey breast we smoked. It was the first food done on the Weber Smoky Mountain Smoker that I gave Good Buddy for Christmas. That one was done with a sweet brine and a citrus rub. The other breast was in a plain salt brine with a traditional (sage, majoram, savory, etc.) herb rub. I liked the herb turkey better. I highly recommend brining. It creates a very juicy end product. We're having a party today. We've had a BBQ on this same weekend for the past three years. It's my birthday on the 30th, so we use that as an excuse to get the summer party season underway. It is always soooo stressful getting to the place where we're finally partying. Either I'm doing too much, or Good Buddy is. And for some bizarro reason, what the other person is doing matters more to the one that is not doing it than to the one that is. Go figure. We always ask each other why the hell we're doing this again, why haven't we learned yet, WTF? Yet, time and again, we arrange gatherings at our house, spend all day marinating and creaming and frosting and breading and slathering and cleaning and moaning and complaining. All for that precious few hours later around the fire with a cold Corona and good friends.